On the 29th of September I made my way to Blood Brothers 2018. It was the 4th annual edition of this event. The Gauteng leg of the event was held at Platteland in Centurion. Marinus and I arrived at the venue at 6 PM to allow ourselves to ease into the event. I had a few beers and watched the second half of the rugby test match between the Springboks and Australia. After the match (which was won by the Springboks in front of a sold-out crowd in Port Elizabeth) I started getting really excited for some rock ‘n roll. Rudi played some lekker rock ‘n roll tunes to get us all in the mood, so that definitely helped. Thanks tjommie. Before you could say “Red Rock Brewery” three times in a row it was 8:30 PM and time for Hellcats to get the Blood Brothers 2018 crowd going. 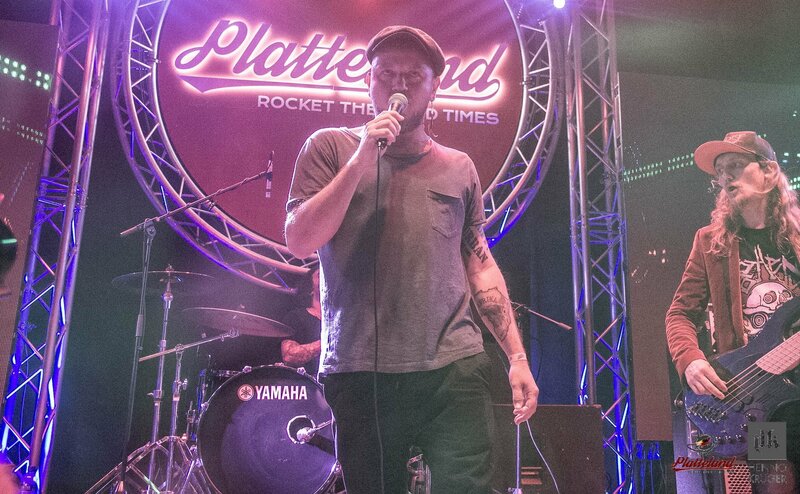 The Johannesburg Garage Rock duo did not disappoint. They had everyone rocking out to their set in no time. If you’re a rock fan and you haven’t gotten round to checking them out yet, shame on you! I can’t exactly remember how the Blood Brothers 2018 set started, but I can tell you that I was completely blown away from the get-go. It was great to see South African musicians doing what they do best – playing great music. Music fans were spoiled rotten by great cover versions of songs like Queens of the Stone Age‘s “No One Knows”, Led Zeppelin‘s “Whole Lotta Love”, Metallica‘s “Nothing Else Matters”, Coolio‘s “Gangsta’s Paradise” and Pantera‘s “Walk” (to name just a few). The 3 hour rock ‘n roll extravaganza also included a few aKING songs, a few Just Jinjer songs, a few The Narrow songs and a few Fokofpolisiekar songs. Few were left disappointed by this concert (which aim is to spread Cancer Awareness among the youth of South Africa). I would like to send a virtual high-five to everyone who I bumped into on the night. You guys and girls rock! You really made my night! To name every single one of you in this post would probably take me a day and a half… so I’m not going to do it. Kudos to Marinus for getting me there and back in one piece and everyone involved in making Blood Brothers 2018 happen. I’m already looking forward to the 2019 edition.